With most of the small birds in the UK being dubbed LBJ's - Little Brown Jobs - I'm always pleased to see one of our more common colourful species! My usual Sunday morning photo shoot was cut short by deteriorating weather, and as the skies got darker and the wind speeds increased, I decided to switch lenses and move my attention from shooting macro images to birds. I wasn't having much luck with subject matter though. The only birds that seemed abundant and unafraid of the camera were sparrows, dunnocks and starlings! As I felt the first of the raindrops, my luck changed as this Goldfinch visited a nearby bush! As is always the case with these small birds, my 300mm lens was woefully inadequate, and wasn't really up to the job, as explained here. However, after taking a few steps closer to the bush, I had a much better shot. 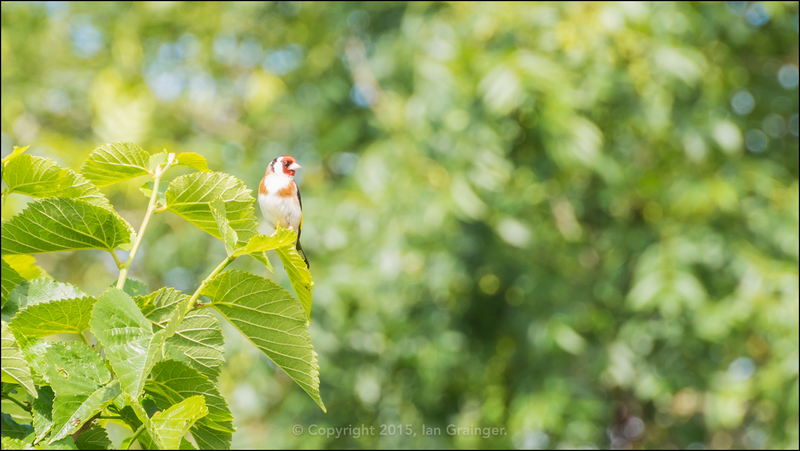 The Goldfinch didn't hang around long, and neither did I, as just after I took this shot, the heaven's opened!